Crispy Breakfast Potatoes are crispy outside, soft insides and a little salty. There are a couple of tricks to getting them really crispy and we’re going to share! There was a time that I thought really crispy breakfast potatoes were created magically by diners everywhere. When I tried to make them at home, they ended up too soft and the potatoes would tear apart or just be mushy. Not that mushy potatoes taste bad because… you know, potatoes are always good. But I love the crispy outside of good breakfast potatoes. Not only do they hold up to cooking but they also hold up the runny eggs I like to pile on top of them for breakfast. 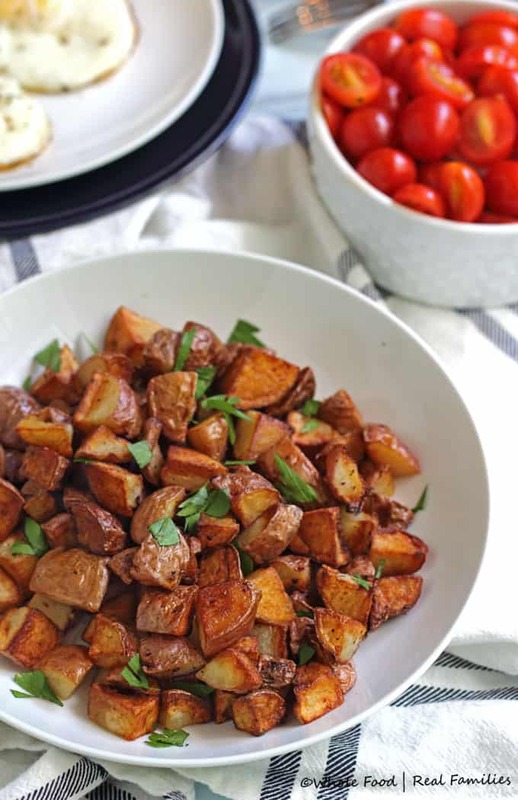 We also like using these breakfast potatoes as a side (or under!) leftover pot roast, ham, or anything else I am looking to reinvent as a new meal. Beef and Eggs over Potatoes is amazing and one of my favorite dinners. There are a couple of tricks to Crispy Breakfast Potatoes. 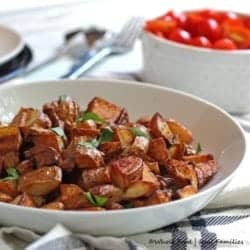 The first is to cut your potatoes into bite-sized pieces – I used to cut them too big. I like to use red potatoes and don’t bother to peel them, they pan fry very nicely. Once you cut the potatoes, cover them in water. The water keeps them from turning brown, but it also helps release the starch in the potatoes. The starch is a contributor to mushy potatoes. Cutting potatoes is always my first step when cooking breakfast (or dinner). Then store them covered in water. If the water gets cloudy, drain the potatoes and add fresh water. If you are better at planning ahead than I am, peel your potatoes, cover them in water and store them in the fridge overnight. When you are ready to pan fry your potatoes, a stainless steel or cast iron pan will give you the crispest outside. A pan with a non-stick coating will make it difficult to get the browned, crispy outside. I also like to use a portion of butter and a portion of olive oil. Looking for more delicious breakfast recipes? 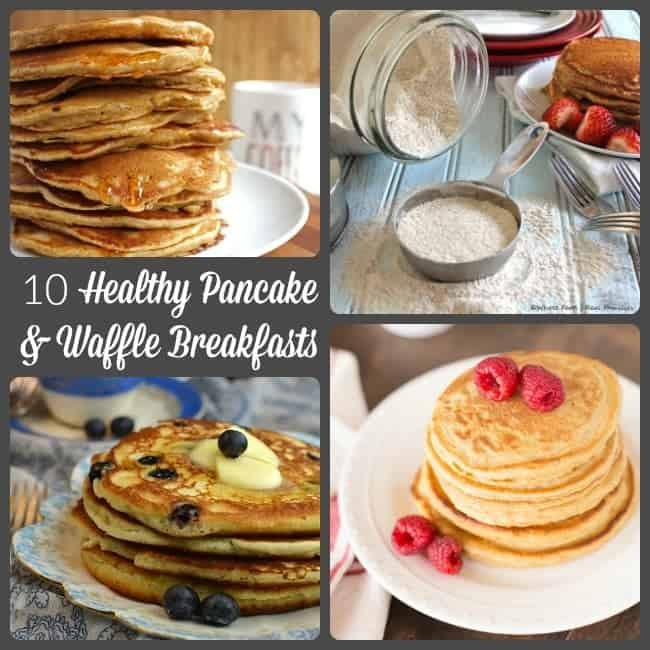 Check out this collection of my favorite Healthy Pancakes and Waffles plus the Homemade Whole Wheat Pancake Mix you should have on your counter. Looking for a hearty breakfast recipe that you can cook fast to feed a crowd? This Avocado Crostini with Beef and Eggs is delicious, filling and cooks crazy fast! Dice the potatoes small, skins on, and cover them in water to release the starch. If the water gets cloudy, drain the potatoes and add fresh water. Heat a stainless steel or cast iron pan over medium heat. You will want enough butter and olive oil to nicely coat the bottom of the pan, adjust butter and oil quantities based on how large the pan is that you are using for the potatoes. When the butter and oil are hot, the butter will start to foam a little, this is when you want to add your potatoes. Pat them dry first, and add them in a single layer to the pan. Sprinkle with Kosher Salt. Allow potatoes to pan fry until the bottoms are deeply golden. Flip the potatoes over and allow the other side to cook to golden as well. Use a spatula to move them around at this point and make sure the potatoes are cooked evenly on all sides. Use a fork and test the tenderness of your potatoes. If they are not quite soft, cover the pan with the lid and allow them to cook a few more minutes until soft. Enjoy hot! Add additional Kosher salt if desired. Top with fresh parsley for garnish! Just the kind of crisp I wanna bite to wake me up in the morning, for a great day ahead! I’d love to add some spices as I’m a huge fan of spices!